With tremendous growth happening in certain business sectors of our country, many businesses are looking to grow their operations in 2019. But what type of expansion makes the most sense for your business? The three most common construction approaches for businesses looking to grow their spaces are expansion, renovation or the creation of a new building, either on existing land or in a new location. Each of these construction types presents a unique set of challenges, but a decision can be made when you consider factors that include budgeting, time frame and the long-term needs of the business. Whatever direction owners decide to go with will involve a great deal of consideration as it relates to their future plans. This includes performing a detailed audit of existing space to understand the limitations and benefits of an existing location, which can help guide the decision-making process as it relates to expansion, renovation or new building consideration. Sitting down with a contractor at this time can be beneficial so the owner can collaborate their ideas and receive feedback on what might work best. Regardless of which option an owner chooses, there are considerations that need to be determined before proceeding. Expansion may be a viable option, but it also requires a lot of coordination of assets during a lengthy construction process. Expansion is probably the best option when a current business location is vitally important to its employees and customers, as long as there is adequate room for the expansion process. An on-site expansion often includes renovation of existing space. During the process owners may take advantage of existing space by reconfiguring the layout to accommodate more personnel while construction is going on. This allows for the business to keep operating while minimizing distractions and maximizing productivity. Expansion of existing space may be more expensive due to the possibility of having to engage in after-hours work, dust protection concerns and phasing to keep areas of existing space operational during expansion. Renovating may also result in higher costs once construction is started because of unknown conditions that may be encountered or deficiencies that may be discovered during the renovation process. 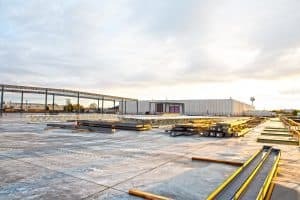 Purchasing a building, leasing, or using an existing offsite building can bring the same challenges and unknowns as expanding current space, but it does allow a business to continue without the distractions of having an active construction site in operation in their production or work space. Depending on the level of renovation required, renovating a new space can remove the need for phasing and will allow for construction to be done in a more efficient manner. Renovation is a good solution when timing is critical, and your business needs to stay operational with limited distractions during day-to-day activities. Building new is an exciting process for owners, as they have the opportunity to create exactly what they want and can start their design with a blank canvas. New construction is an outstanding solution for companies that may have special requirements and want to plan ahead for future growth. With new construction, there are likely to be fewer restrictions compared to expansion or renovation. But sometimes the process can be lengthy when it involves procuring land, plan development, municipal approvals, site work and construction from the ground up. With new construction the procurement, design, and approval process can take as much time as the construction process itself, depending on the level of the construction complexity. Whether you decide to expand current space, renovate an offsite building or build new, owners should take the time to consider what is most important to them when it comes to growing their current space. Location, timing and budget, along with other factors should be examined ahead of time to determine what mode of expansion works best for the business. Getting a contractor involved early in the process can help guide owners into what solution makes the most sense. Ultimately as an owner, you want be sure to keep the momentum of your growing company moving while at the same time making the best decision for your future.